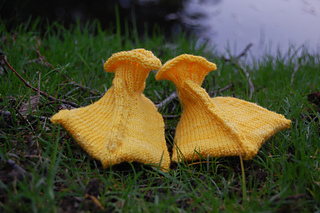 Note that the English language version is available through the original knitty publication, not as a downloadable pattern. Many thanks to prjonastelpan for providing the Icelandic translation, and to Belskaya Elena for the Russian translation. DPN enthusiasts, please see this video kindly posted by Mojen, for adapting the Turkish cast on technique. For a faster knit version (Oct 2011), please see the accompanying Ravelry download. For a toddler version, please see Booby socks. 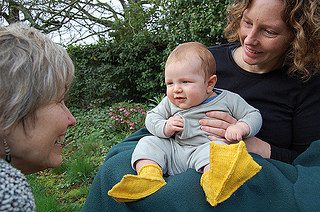 For an adult version, please see Felted Duck Slippers. Are you getting holes with the Turkish cast on sts? If you have a hole between the cast-on sts and the work, then use a third needle (or temporarily replace sts on L needle) and manually tighten up the yarn, first along the bottom non-active needle, and then along the sts you just knitted. When you get to the last stitch worked, pull out the slack in your working yarn.